NaturalNews) In the quest for finding the perfect preparedness and survival gear, I've become something of a gear head. Especially when it comes to flashlights: I've bought and testing probably fifty lights over the last three years, and most of them turned out to be less than illuminating. But for the last six months or so, I've been using and testing a brand of lights called Fenix. It turns out these lights are the new choice of law enforcement and military personnel everywhere, because they're just as rugged as high-end brands, but they're far more affordable. Fenix flashlights are made out of aircraft-grade aluminum, and they're made with rubber O-rings (to keep out water), electronic voltage controls (to prevent the light from fading out), and multiple modes of operation (low, mid, high, strobe, SOS, etc.). Inside, the lights all use Cree LEDs, which are virtually unbreakable and will last (nearly) a lifetime. These are the highest quality LEDs available in the world today (see below). All these lights are available right now at www.SupplySource.com - the new online discount retailer of rugged preparedness gear created by Mike Adams (that's me) and Daniel Vitalis. Together, we're on a mission to discover the very best preparedness gear available and bring it to you at the lowest prices possible. No junk, no garbage, no compromises. Just top-of-the-line reliable gear at direct-to-consumer prices. All Fenix flashlights are in stock and shipping right now. All are priced at the "minimum advertised price" allowed by the manufacturer. Batteries: 1 x common "AAA"
Perfect for: Small backup light. Easily added to an overnight pack as a backup. Great for carry in a purse or even on a keychain. Perfect for: Pocket carry. Because it uses common "AA" batteries, you can always stockpile some NiMH batteries and a solar charger, so you'll have plenty of light even after a grid down collapse. Slim design rides easily in a pocket. Perfect for: Daily pocket carry. I don't go anywhere without this flashlight. It's with me when I'm hosting radio shows, filming videos, collecting eggs from my chickens, or talking a walk on the ranch. I find a hundred uses every week for this light, it seems, from checking on ranch animals to illuminating dark parking lots. Perfect for: This is a great night hiking light. At 820 lumens, it lights up the entire walkway. If you don't like it running at 100%, it has four different power modes so you can run it on less power. Perfect for: Outdoor use on a farm, ranch or large yard. Really lights up the night. The common battery type makes this a no-brainer for preppers and survivalists, but swapping out 8 batteries is a bit of a hassle. I personally like the TK35 (above) better. Perfect for: Illuminating the night in a way you've never experience before with a hand-held light. These 2200 lumens are so bright that I usually don't use this light on full power. It's more than sufficient on "medium" power. Remember: This flashlight is huge. Definitely not a hiking flashlight unless you need to fight off bears with it. It's about half the size of a baseball bat. A lumen is a measure of light output. The higher the lumens, the brighter the light. A small handheld camping light might only produce 10 lumens. That's actually plenty to see what you're doing in a campaign tent at night. 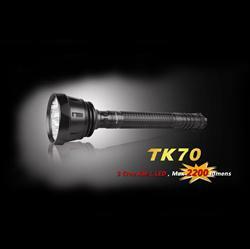 Our largest flashlight, the Fenix TK70 (http://www.supplysource.com/flashlights/fenix-tk70-flashlight), produces a whopping 2200 lumens. How much is that? I've used it to light up coyotes and wild pigs at well over a quarter mile away. It's very, very bright. Almost ridiculously so. Cree is the U.S. company that designs and oversees the manufacturing of the world's most reliable LED lights. There are cheaper lights made in China and designed in China, but they are plagued by problems with high heat and short life (early burnout). Cree is the most trusted name in LEDs, and their engineering is robust and well proven in the field. These are the li-ion batteries used in high-end flashlights everywhere. Police officers and soldiers don't trust their lives to regular alkaline batteries (they're heavy and short-lived). Instead, they all use CR123A batteries, which are long-term storable lithium-ion batteries. These batteries are storable for 10 years or more. There are rechargeable CR123A available, but I have not found any reliable brand that actually works, so I recommend avoiding rechargeable CR123A for now. These are high-powered li-ion batteries which are roughly the size of two CR123A batteries. They're used throughout high-end lighting and laser devices (such as powerful laser pointers). The beauty of many of the Fenix flashlights we offer is that you can use either CR123A *or* 18650 batteries in them, giving you tremendous flexibility. There is a brand of rechargeable 18650 batteries that works very well. They're imported from Japan and we are in the process of adding them to the store. Beware of cheap 18650 batteries that have very little capacity. Which light do you really need? 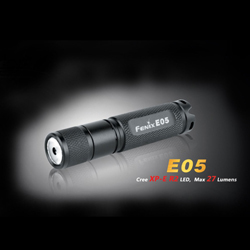 As a backup light, everybody needs the E05 (http://www.supplysource.com/fenix-e05-flashlight). 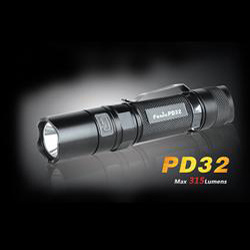 The best pocket carry light for daily use is the PD32 (http://www.supplysource.com/fenix-pd32-flashlight). 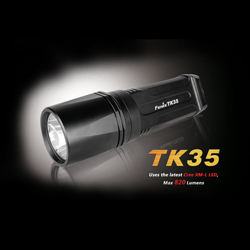 The best outdoors light for hiking, ranching, etc., is the TK35 (http://www.supplysource.com/fenix-tk35-flashlight). 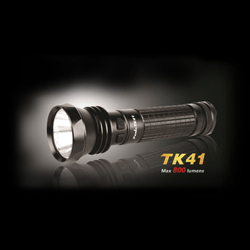 The "ridiculously overpowered" light, if you need one, is the TK70 (http://www.supplysource.com/fenix-tk35-flashlight). Alternatives to these lights use more common batteries. 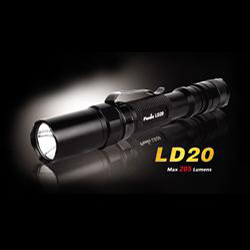 For example, the LD20 can replace the PD32, but it's less powerful. The TK41 can replace the TK35, but it's a bit of a hassle to swap out 8 "AA" batteries. Regardless of what you purchase, you'll be amazed at the quality and durability of these lights. These are definitely Health Ranger approved lights, and they pass my durability tests on the ranch in Texas. If they can survive the abuse I put 'em through, they're definitely ready for prime time.